The number one selling comic book of all time, X-Men #1 (1991), sold over 7 MILLION copies. It was released with 4 variant covers and a “deluxe” edition with a gatefold cover and glossy pages. 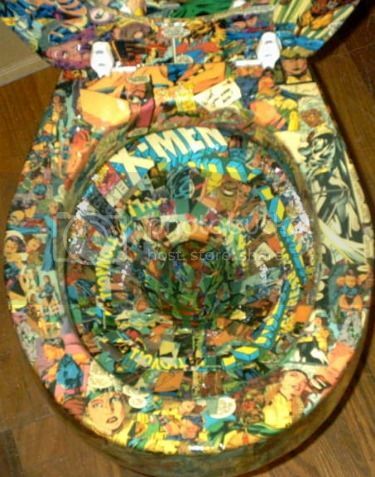 One of each of the variants along with a deluxe, gave their useless lives to decorate this ’70s era Standard American toilet.The issues were carefully deconstructed, panel by panel, cover by cover using scissors and X-Acto blades. Hundreds of separate images were glued to every square inch (other than water holes) of the bowl, tank, seat, and lids. … The whole process took upwards of 80 hours and a full pint of polyurethane. And (2), as indicated by the Ebay listing, you should not actually use this “toilet” as a bio-waste-disposal apparatus. 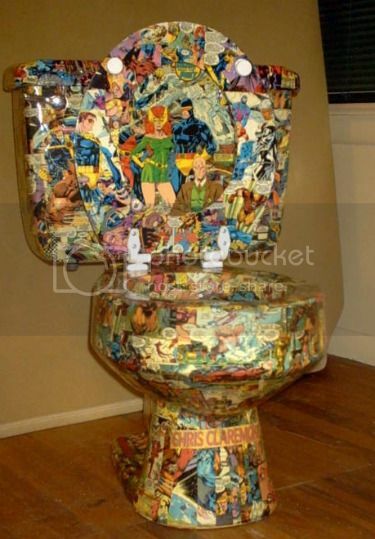 You know… just in case you were shopping for an artsy toilet upgrade on Ebay. A disclaimer: I CAN NOT guarantee the efficacy of this art piece if it were to be installed as a working toilet. Via Bleeding Cool by way of Nerdcore, who’s afraid to use this thing sitting down, lest he touch Rouge’s bake skin.